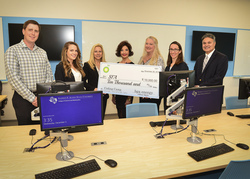 Stephen F. Austin State University's College of Sciences and Mathematics recently received funding from BPX Energy for the development of a summer camp that will encourage girls to develop computer coding skills. Representatives from BPX and its corporate partner Align Midstream visited the SFA campus to present the donation. Pictured are, from left, Kyle Ross, BPX site manager; Lauren Madden, Align Midstream business development assistant; Kim Krieger, BPX vice president of integration; Dr. Kimberly Childs, dean of the College of Sciences and Mathematics; Dr. Deborah Dunn, professor and chair of the Department of Computer Science; Pippa Zimmerman, BPX vice president of operations for the East Texas Business Unit; and Gil Bujano, BPX regulatory engineering advisor. NACOGDOCHES, Texas - Representatives from BPX Energy recently presented a donation to Stephen F. Austin State University's College of Sciences and Mathematics for the development of the Ladyjacks Who Code camp, launching in the summer of 2019. Hosted by the college, the STEM Research and Learning Center and the Department of Computer Science, the camp is designed to create engaging experiences for students who have completed sixth or seventh grade, blending both online and "unplugged" experiences. "Students will learn to create computer programs designed to enhance collaborative learning, develop problem-solving skills and teach persistence through difficult tasks," said Dr. Kimberly Childs, dean of the College of Sciences and Mathematics. More information about Ladyjacks Who Code to follow at stem.sfasu.edu.